Zoe wasn't the only one to get this tired. The past three weeks have been truly a life changing experience. As Professor Vamvakas said on our (very sad) drive to the airport, "We live in a very educated, very wealthy sector of a very educated, very wealthy country." I mention this because the past three weeks of very intense learning made me realize that I know nothing. In Greece I saw people speeding down windy mountain roads on their mopeds carrying their helmets. I saw a people who have been made famous for their debt crisis open their arms and homes for twelve American students they hardly knew. I saw the women who took care of us during our stay cry to see us leave. Most of all, I saw that, like carrying their helmets, some of the things "normal" in Greece may see a little backward to the average American. This, however, had no affect on the amount of love in their hearts or generosity they had. I was blown away that a culture that had less and less every day was still willing to let us in to their hearts and homes. It has revitalized my commitment to learning while simultaneously teaching me that I know and relate to a small fraction of the world. Maybe, just maybe, if I can keep my heart and mind as open as the Greeks do, that can change. The island never stopped being beautiful. It wasn't all work. There was some play involved. Just before our fair well dinner. In any case, I would like to sincerely thank all of those who have aided me on my journey. Thank you especially to Professor Vamvakas and Professor Kapsomenos for this amazing opportunity, Professor Kulich for her wonderful insights (both in the classroom and out), and Professor Martin for two wonderful lectures. 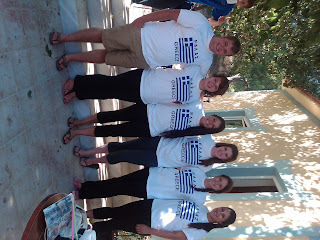 I would like to thank everybody we came into contact with in Alikianos for all of the wonderful lessons learned. A special shout out to my Sisterhood and the Bronze Bros. None of this would have been the same without you, and I miss you all! Finally, thanks to my Mom and Dad (who I know are reading this) for their support and willingness to let me go. The last few days have been very intense, as we continued our fast pace academically and culturally. The students wrote response essays, had final exams and presented a policy paper on addressing the Eurozone crisis in the context of global governance. We continued to travel around this corner of the island, interact locally, and take in some beach time and shopping. 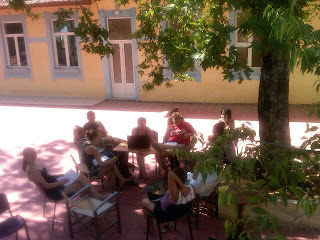 Students put in long long hours finishing projects and writing papers as well as participate in a number of activities. 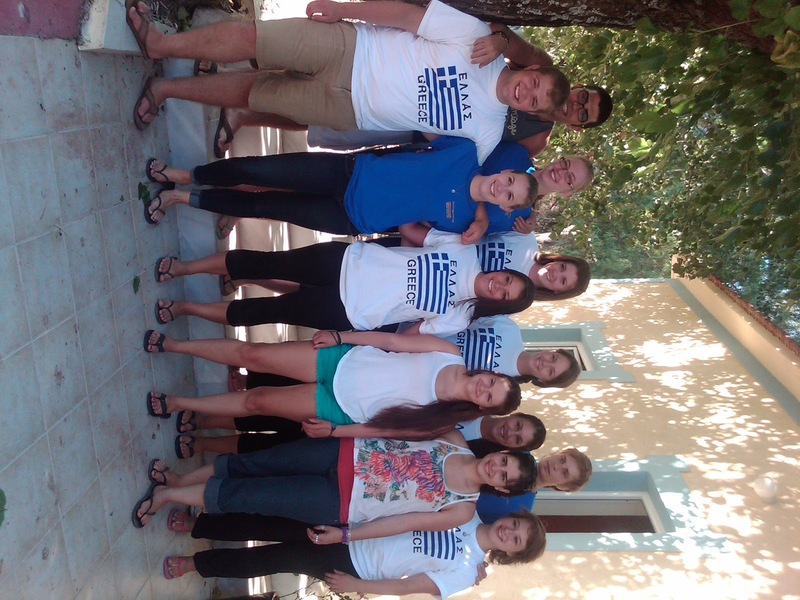 The 9 students who studied in the immersion Greek program had a marathon 4-hour Friday class, which included face to face conversation. On Friday night the Institute of Cretan Studies reenacted a summer solstice traditional celebration which coincides with the birthdate of St. John the Baptist's birthday celebrated in the Orthodox calendar on June 24th. All the Emmanuel students actively participated, some re-enacting, others dancing, or jumping over fires, or even in the telling of Cretan rhymes (Mantinades). Mary Gilcoyne's rendition was by far the best. Mandinades were written and performed for the program and the students individually. In the days to come this blog will be flooded with pictures, and stories, as the participants in the program have time to rest and reflect in this amazing experience. The students have all arrived in Boston safely bringing with them flavors and experiences that will last them a lifetime. This has not been a relaxing ClubMed experience, as it was not meant to be, rather there was a great deal of work, discussion, frustration, immersion, fun, exploration, learning and fulfillment of a goal achieved. Congratulations to all and an immense gratitude to all for allowing me to be part of this program. This past Sunday was quite adventurous! The class decided to take a cruise to a local island and check our Crete's neighbors. We sailed to a small island that had a castle at the top. We hiked up and was almost blown off the top by strong winds. 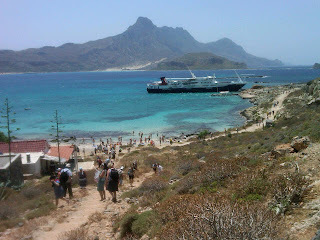 The view below was gorgeous and revealed Greece's beauty ... and a sunken ship! We then proceed to chase a white rabbit down the mountain before going for a quick swim in the water. Over all, a really great day! Attentively listening to lecture, given by the mayor. It is hard to believe that we are in the final week of a very exciting and demanding EC Mediterranean and Security Studies program, which is hard to summarize in a few lines. 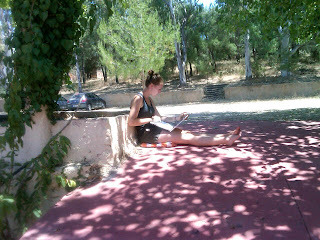 Last week beyond the 6 hours per day of in-class instruction, including 2 hours of Greek every day, we met the mayor of the local municipality, took a tour of the firing range of the NATO base on the island, went to the beach every afternoon, had a Cretan night celebration in honor of the Emmanuel faculty and students. The students have been great, and I believe that it will take some time before they fully appreciate what they are experiencing in these last two weeks. One of the highlights of last week was the Cretan Evening celebration, that the Institute of Cretan Studies organized in honor of the Emmanuel College students and faculty. Faculty and students danced and the celebrations lasted into the early morning hours. This week we are looking forward to a visit and two guest lectures by Professor Martin, and a week of lectures by Professor Kulich. In addition we will continue to follow the historic events in the area, including the follow-up and fallout from the Egyptian, Greek and French elections of last weekend, participate in a couple of after school local events, and daily beach visits at our favorite local place, that has become a students' favorite. Although, I could be writing for a long time and sharing many stories of the last two weeks, an impressive evolution is the level of Greek that the students have learned in a matter of a couple of weeks. At the end of this week as part of their overall evaluation, the students will be visiting local stores and will be evaluated on their exchanges with the store owners. Today we went to Knossos, the birth place of the legends of the Minotaur and Labyrinth. We learned about the ancient civilization of the Minoans and their powerful navy. They dominated trade routes and were feared by all. Surprisingly, the ruins show no evidence of barriers meaning that they were very secure in their homes. Trey actually were a peaceful people who were never challenged by others. They were so strong that they stood for thousands of years and eventually fell to natural disasters. We then stood on the oldest road Europe and followed it to explore the neighborhood. 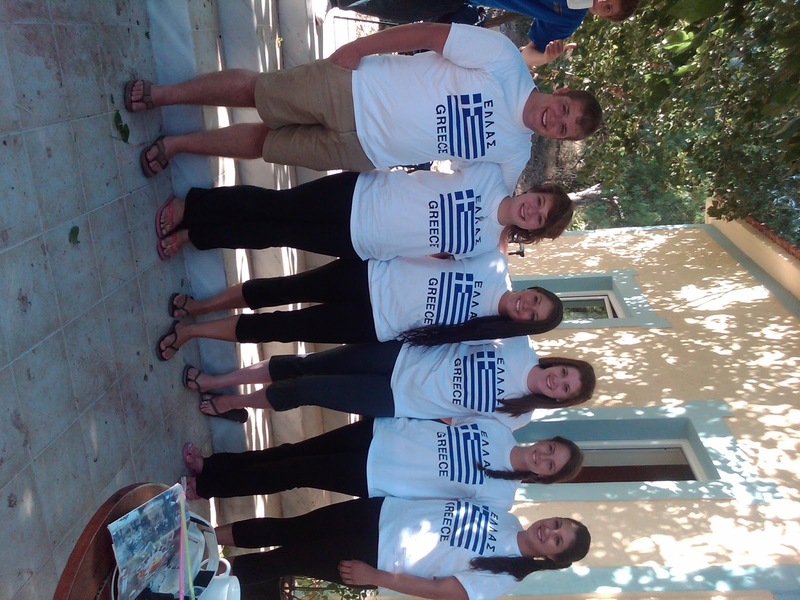 Emmanuel students have a unique opportunity to experience the beauty of Greece while studying the geopolitical complexity of the continental crossroads of the Eastern Mediterranean for three-weeks, in an intensive, 8-credit international relations program. 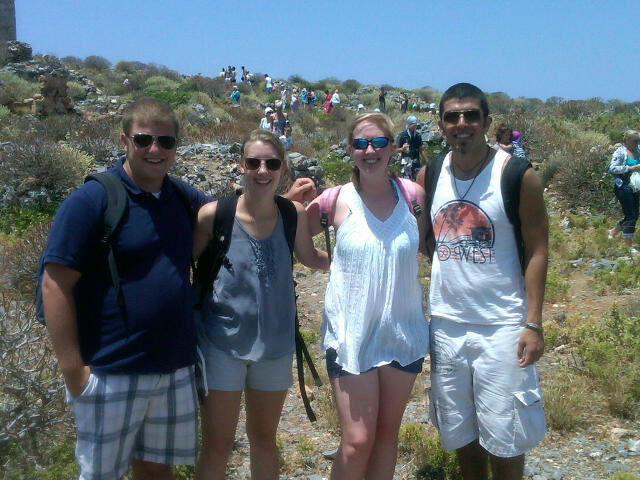 The curriculum combines a unique study abroad program, taught by Emmanuel faculty, with an extended classroom experience in Crete, with field trips and excursions while in residence at the Institute of Cretan Studies.